The first, and increasingly popular, diamond alternative is Moissanite which is meant to look just like a diamond, and it surely does! Without extensive training, you cannot tell the difference between a natural diamond and moissanite. Moissanite is a compound called carborundum and it is even rarer than a diamond in its natural state. 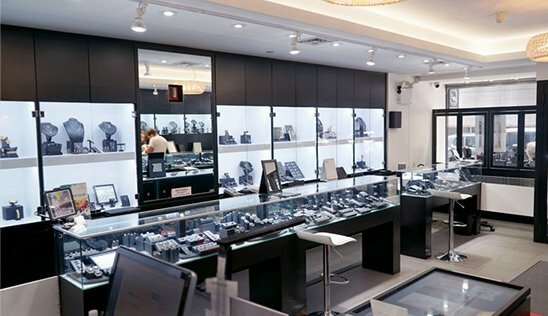 Moissanite is produced in a laboratory under extreme pressure and heat. This gem has a higher dispersion that diamond, meaning it divides light into spectral colors even better than a diamond, making its level of fire and sparkle greater than almost any gem. It is also a 9.5 on the Mohs scale of hardness, second only to diamond, which makes it extremely durable. 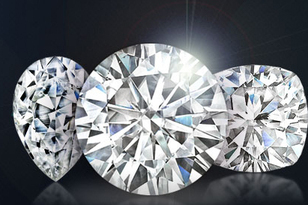 These main factors make Moissanite quite possibly the best alternative to diamond out there. Be sure to check out Forever Brilliant, Amora or Asha as these are the most popular producers of these gems to date. Some other notable diamond alternatives are lab created diamond, synthetic white sapphire (corundum), and cubic zirconia. Lab created diamonds are not “fake,” they were just created in a laboratory under conditions mimicking that of the Earth’s core. They have the same chemical, physical, and optical properties as diamonds because they are diamonds. The amount of resources, money, time, and energy it takes to make diamonds in a lab makes them almost as expensive as the equivalent quality natural diamond. Synthetic or white sapphires are a great alternative to diamond. Just as with lab created diamonds, synthetic refers to the fact that they were created in a lab, but they are quite in fact, sapphires. Synthetic white sapphires can be very brilliant and are a 9 on the Mohs scale, making them another durable and sparkly diamond lookalike. Interestingly, synthetic corundum (sapphire) is all around you every day. Your nice watch, the scanners at the grocery store, the touch screen on your Iphone, and many other objects used every day, are made with synthetic colorless sapphire! When fashioned into a crystal and cut into a gem, it can be a beautiful and inexpensive diamond alternative. Cubic zirconia is the last alternative that looks like a diamond to discuss. It has been used as a diamond simulant since the mid-1970s. Like Moissanite, it is a very durable (8-8.5 hardness) alternative to diamond and also has a higher dispersion, making it full of fire and sparkle. It is the lowest cost diamond simulant, so almost all modern “costume” jewelry or look-alikes are mounted with Cubic Zirconia, sometimes even in precious metals like gold and silver. Not only is it a very convincing diamond simulant, but it is now produced in every color you can imagine to create a very low cost alternative to any rare and expensive natural gem! Finally, there is heirloom jewelry. Many people find that their relatives have a piece of jewelry that has been, or is waiting to be passed down. Not only does this create a lot of sentiment, but it can save thousands and thousands of dollars! We specialize in custom, hand-made designs, so we can create any of them to fit basically any size or quality gem, as well as any type of gem. Whether you desire a diamond or something that looks like it, or a unique colored stone, someone in your family may want you to have it so that it is loved and cherished for further generations. You never know what gems or jewelry may be in your family, but ask gently of course! At Lauren B we can help you source these stones directly from our manufacturers or you can purchase them independently and have them shipped directly to our store. We make our custom designs for any type of center-stone so any engagement ring design you see on our website can be custom made for the center-stone type of your choice. Here are some general pricing guidelines to consider for these alternatives can have a vast price range based on the quality of the material and in some cases the brand that produces them. If you are interested in learning more in detail about one or any of these options, please contact us here at Lauren B and we will be happy to give you all the information you need. Diamond alternatives include the fabulous stone, Moissanite. Let Lauren B jewelry show you why a diamond alterative may be the perfect gemstone for your engagement ring.